Bleary eyed from too little sleep on the night train, we arrived at the Xi’an Railway Station before 6:00am on Monday morning. We dodged a particularly annoying tout and managed to find a regular metered taxi, which took us for the quick ride ($5) to the Ibis Hotel ($24/night) where we were able to check in right away. It was so nice to have a comfortable standard western-style hotel room! We showered and changed and regrouped at 8:00am for a field trip to Starbucks. Caffeine was definitely needed. We had our usual orders, plus a whole wheat muffin ($13). Hannah and Neil went back to the hotel to have a nap, and we turtles hung out for a couple of hours to blog, Skype with our family, and plan out our next few weeks. We had a stroll around the Wanda Mall (where Starbucks was located) and when it was time, walked over to the Bell Tower to meet Hannah and Neil. Together, the four of us walked around the town, mostly wandering the streets of the Muslim Quarter, stopping to eat some lunch at a noodle shop (one big bowl of hand-pulled noodles and two drinks for $4). This isn’t your Jerusalem Muslim Quarter by a stretch – we found the streets and alleys very enticing, Arabic peppered between Chinese on the signs. 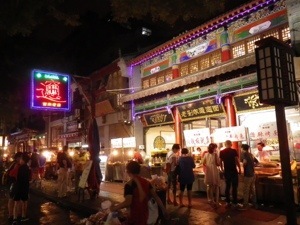 We tasted all sorts of goodies from street stalls and carts, including jujube cakes, moon cakes of various sorts, quail egg, semolina cake on a stick and a deep-fried banana ($0.30-$1 each). After two hours on our feet wandering around, we were tired, so we found a taxi ($3; not a simple task in Xi’an, where demand is high and drivers are picky) to take us back to the Wanda Mall for another important cultural experience. 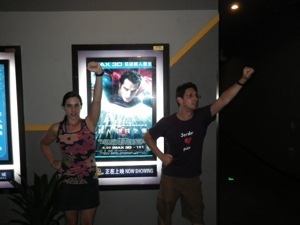 Maintaining our connection with the Western world had become increasingly important in China, and Hannah and Neil have a tradition of experiencing cinemas around the world, so we agreed that Superman in 3D would make us all happy. We bought a membership package combo ticket, which included four seats, a large popcorn, two sodas, and a Häagen-Dazs ice cream ($15 per person). The theater was new, and we’re pretty sure that the volume intensity would be illegal in the US. So basically, it was awesome! We wandered the mall in search of dinner, eventually settling on a home-style Chinese restaurant, where through pantomime and google translate we managed to order eggplant, dumplings, fresh veggies with a dipping sauce, and rice ($15 per couple). Exhausted, we walked the 15 minutes back to our hotel and crashed, but not before hanging out in the lobby with the wifi for a bit. Xi’an is famous for the magnificent Terra Cotta Warriors – a world-class archeological gem located just outside of the city. Built as the grand mausoleum of first Qin Emperor in 210 BCE and containing over 8,000 soldiers, 520 horses, and 130 chariots, all individually crafted and buried with the emperor to protect him in the afterlife. First unearthed in the 1970s, this form of funerary art is a sight to see. We set out around 9:00am after downing some espresso, walked to Holiland Bakery for some breakfast (cheese bread and a pastry, $3) and just as it began to drizzle, got on the city bus ($0.30 each) to the train station. There, we got on the 306 bus ($1.16 each) for the one hour ride to the site of the warriors. The bus dropped us off in a parking lot outside the complex, and we made our way through a pathway lined with shops and stalls to the ticket counter. We purchased our tickets ($12.50 each, student rate) and walked about 15 minutes past many more shops, to the entrance gate. From there, we walked along the wide paved path to the warriors complex. 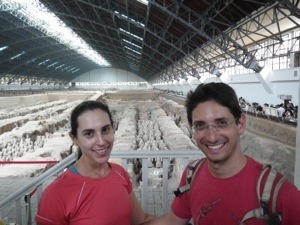 Cleverly, we began by visiting the new museum, which provided a good overview of the history, archeological process, and details of the artifacts. The English explanations were pretty good, and we spent well over an hour moving through the exhibits. Ready to see the real thing, we planned our route to build up from the smaller to the largest display. Pit 3 housed a handful of figures and was manageably small. Pit 2, while large, was mostly covered, leaving pockets of figures exposed for viewing, and helped us appreciate the archeological process. Finally, Pit 1 was overwhelming, both in the number of terra cotta figures, stretching out hundreds of meters in front of us, seemingly going on forever, and the number of Chinese tourists crowding every available space around us. Nonetheless, it was really cool to see the sheer number, but even more impressive was that each one was unique, with its own individual stance, clothing, facial expression, hairstyle, weapon, and coloring. Even the horses were individually crafted with their own special features, and all this formed into clay and preserved for so many hundreds of years. Having seen the museum and all three excavation pits (which are each covered by a building), we headed back toward the bus, stopping for lunch along the way. We shared a barbecued sweet potato and corn on the cob ($2) while Hannah and Neil went for the noodles. We browsed some shops on the way to the bus, and Felix was proud that he had managed to make it through the whole drizzly day without melting in the rain. 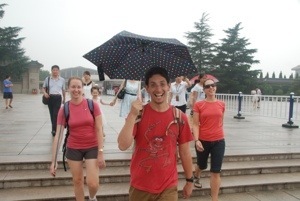 Good thing Jordan let him have the umbrella! The bus ride back was uneventful ($1.30) and upon arrival back in Xi’an we returned to our hotel to freshen up before dinner. We ventured out around 7pm in search of a dumpling restaurant we had read about in Lonely Planet. Finding a tuktuk outside our hotel was easy, as was the price negotiation, and a scary whirlwind 10 minutes later we arrived at the Bell Tower ($1.66). Our maniac driver was able, in this short time, to drive on both sides of the road and a sidewalk, cross at a crosswalk, and luckily dodge all the cars playing chicken with him. Relived to be back on foot, we searched the area and eventually found the restaurant. The De Fa Chang Dumpling Restaurant, while famous, was overpriced and had run out of many items. We shared a plate of really good veggie dumplings, a tofu noodle salad, and cucumber salad as an appetizer ($10) course and decided to move on to another restaurant for our main meal. Since we had enjoyed the Muslim Quarter so much the day before, we headed back there (only a few minutes walk) and wound up having a progressive dinner, each person choosing a different dish. Jordan had a greasy egg and scallion pancake ($1.30), and Felix had some cold sesame noodles ($2). We wandered the bazaar, picking up a few items that we had wanted. Neil was very happy with his new NorthFake backpack ($22) and the Turtles bought Hannah a customized handmade calligraphy saying “The Hall of Supreme Procrastination” loosely translated into Chinese. We also found chopsticks and stuffed pandas at bargain prices, and everyone ended the night happy. We bargained our tuktuk down to the same 10 RMB ($1.66) that it cost us to get there and after some more wifi time in the lobby, turned in for the night. Wednesday morning, after packing up and checking out, it was time for our finale with Hannah and Neil, and as is our custom, a parting brunch was in order. We left our big bags at the front desk and walked over to Jamaica Blue. A bastion of Western culture, this cafe and hostel is tucked off a side street in central Xi’an. We were all so happy to read the options on the English menu, that it was hard to make a choice. Coffees all around, of course, were accompanied by yummy food. Hannah had a chicken sandwich, Neil went for the “Big Breakfast”, and the Turtles shared eggs florentine with smoked salmon and a roasted veggie sandwich ($32 per couple). While this was one of the most expensive meals we’ve had in months, sometimes you just have to have what you want. This was a small consolation for our sad parting with Hannah and Neil who left from brunch to fly to Hong Kong. 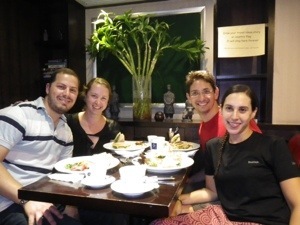 We are so happy that they came to join us, and we really enjoyed our time together. Maybe we will travel together again someday. The rest of our day was spent planing for the next stop on our journey and stocking up on supplies. After staying at Jamaica Blue for a couple of hours, we wandered back to the Wanda Mall, where we visited the supermarket and got some dinner ($10 for braised eggplant, cucumber salad and rice). We returned to the Ibis Hotel one last time to collect our bags and took the bus to the train station. A little nervous about sharing a 4 person soft sleeper ($50 per person) with strangers, we were relieved to find an elderly lady and a quiet young man as our companions. They both went to sleep right away while we blogged and watched an episode of Smash. We went to sleep around midnight, and were woken by the sound of our companions leaving the train at around 7am. We went right back to sleep, and were very happy to have the cabin to ourselves for the remainder of the journey. Considering that the train was delayed by a few hours, it was especially fortunate that the cabin was all ours for the whole morning before arriving in Chengdu in the afternoon.